The tranquility of a rainforest as epitomised here in the Sungai Kanching Waterfall, Bukit Lagong Forest Reserve north of Kuala Lumpur. Imagine stepping into the shadows of a thick green forest canopy, feeling the cool, damp air as it flows into your lungs and tuning in to the rhythms of the forest: the chirping of birds, the hisses of insects, the fluttering of wind-caressed leaves; And yes, the barely audible humming and honking from the traffic in distant roads. A faint reminder of us still within the urban zone. 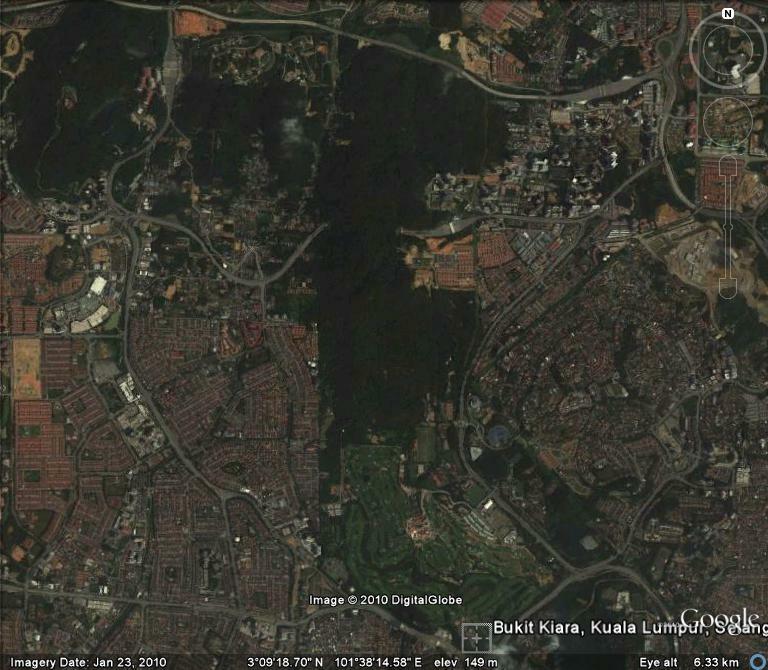 Welcome to Kuala Lumpur- minus the city! Soft, warm beams of rays shines upon Bukit Kiara's secondary forests at sunset. 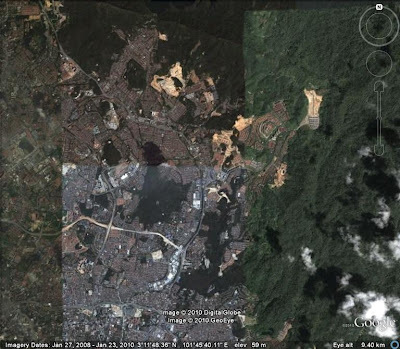 It is hard to imagine that the Malaysian capital, despite facing the onslaught of large scale crop estates, extensive mining operations and of course, the continuing urban sprawl, still has some rainforest tracts in its vicinity. These remaining green lungs of the metropolitan region have been of great aesthetic and scientific values in recent years. The exponentially growing support of many KL urbanites in retaining these valuable assets is a testimony to their importance. What is more surprising is to consider that just decades ago, these same people used to think of the rainforests as nothing more than a bane to the city, an obstacle that must be removed in the pursuit of modernisation. So what made KL's forests such an enviable feature of the city for the people? Some of the wildlife typical of KL's secondary forests include the native long tailed macaques (Macaca fascicularis) and introduced species such as the Eurasian Tree Sparrow ( Passer montanus) and Rock Pigeon (Columba livia) as seen here in Bukit Kiara. Perhaps, it is because of the fact that they are located in one of the world's biodiversity hotspot and the sad irony of their imminent destruction by nondiscriminatory urban sprawl. Or is it because of the increasing appreciation brought by visiting foreigners? After all, it is no surprise to find that many KL visitors often quoted the uniqueness of this modern capital juxtaposed with evergreen hills of tropical rainforests. Or probably KL urbanites have come to terms with the importance of sustainable development which cares for the present and future generation economically, environmentally and socially? A view of the majestic Bukit Tabur Quartz Ridge in Selangor State Park. Either way, one thing is for sure: With "infrastructural development" high on the agenda of city planners and the die-hard old-school thinking of "environmental blitz" in the name of progress, these precious tracts of remnant forests are at the mercy of bulldozers and chainsaws. 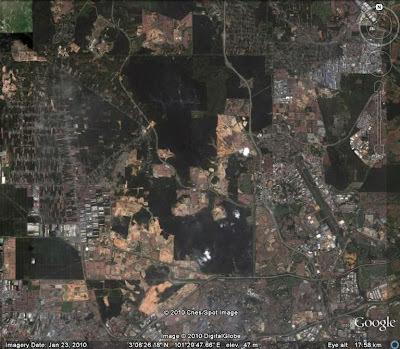 To add salt to the wound, urban sprawl has since spilled beyond the city's boundaries into the surroundings, resulting in a continuous tract of build-up area dotted with remnants of secondary rainforests and abandoned plantations. Probably the only natural tropical rainforest in the heart of the city (literally! ), this tiny 0.11 kilometres square (11 hectare) patch of vegetation holds a surprising number of large trees and some common forest wildlife including macaques and some forest birds. Fortunately, everlasting interest expressed by past city planners as well as today's tourists and locals have made it into an economic asset worthy for protection and thus, gazetted as a Forest Reserve in 1909. This forest might also be of great scientific value as it provides a perfect field for studying the effects of urbanisation around an isolated patch of tropical rainforest. 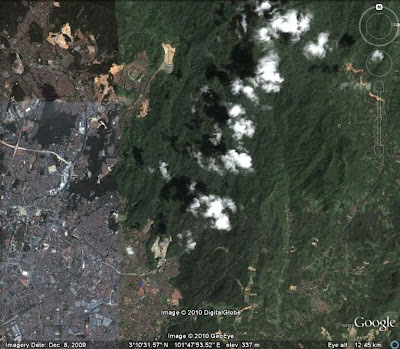 The region bounded by this three hill areas has plenty of old secondary forest that are very photogenic and unique to Kuala Lumpur. It is the only area in the city centre where rainforest vegetation fringe the highways and is aesthetically pleasing to the passerby and local residents too. Hence, the highly sought-after residences within the area and is probably one of the factors that explains why there has not been plans to clear the forests for high density development to date. Although fragmented in nature, these forests have served as the only available habitat for native wildlife for miles in the metropolitan area. The headquarters of the Malaysian Nature Society (MNS) is located here and has an educational forest trail for visitors to experience the highly accessible rainforest. Literally an ecological island in a sea of buildings, this is the only limestone outcrop that is surrounded by the city. It is one of the important assets of KL covering cultural values (it being the location of the famous Batu Caves Sri Mahamariamman Hindu Temple), recreational values (Batu Caves is the prime location for rock climbing, caving and other speleological activities in Kuala Lumpur) and scientific values (with a dozen endemic species of flora and fauna including snails and cave insects as well as the rare Kambing Gurun or the Sumatran Serow, Capricornis sumatraensis. The geological massif is threatened by limestone quarries and pollution effects due to its proximity to build-up areas. 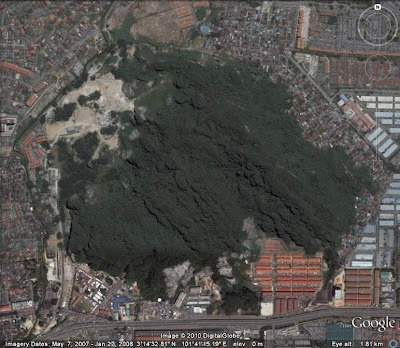 This large tract of semi-continuous low altitude hill forests contains two of the three limestone outcrops of Klang Valley, Bukit Takun and Anak Bukit Takun (the other being Batu Caves), and has potential of harbouring many endemic species as is the case for most karstic formations. Nearby, a multi-tiered waterfall in the Kanching Forest Reserve receives high visiting numbers by locals and foreigners alike while Bukit Lagong is home to the Forest Research Institute of Malaysia (FRIM). Some endemic species found so far includes the reintroduced endangered plant Begonia aequilateralis in FRIM, diterocarp tree Hopea subalata in Kanching Forest Reserve and Lipthistius batuensis in Gunung Anak Takun. An indigenous reserve, it is among the few remaining wildlife refuge in the northern Petaling district. It has an economic potential to be developed as an educational and research field by the indigenous (mostly Temuan tribe) residents to attract locals and tourists and guarantee a steady flow of income and social benefits to these low-income communities. 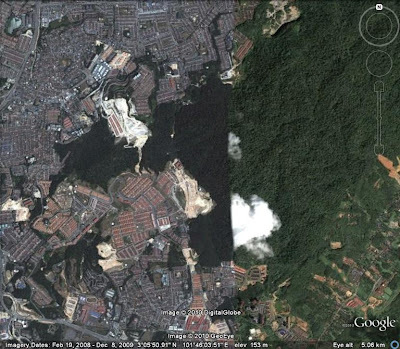 Sadly, the forest are threatened by hill slope development as lowlands have already been occupied by buildings. while the southern portion of the hill has been cleared to make way for a golf course. Yet another forest that faces the same scenario as those above, Ayer Hitam is unique in its crucial role for forest-based research conducted by the nearby Univerity Putra Malaysia. 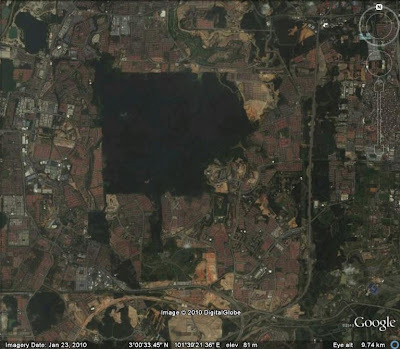 It is also one of the largest remaining forest completely surrounded by urban functions, thus it houses a great deal of wildlife and plantlife representative of the Klang Valley's extremely rare lowland forests. Furthermore, a study has indicated that there is 33 endemic and 30 new records out of 319 species of trees surveyed in just a 5 hectares plot. Mammals that are reported to inhabit this 12.48 km square (1248 hectares) rainforest includes rats, squirrels, rarely seen moonrats (Echinosorex gymnurus) and the charismatic Slow Loris (Nycticedus coucang). The Orang Asli (Indigeneous people) of the Temuan tribe frequents the forest for its natural products while local residents often conduct hiking trips there as well. 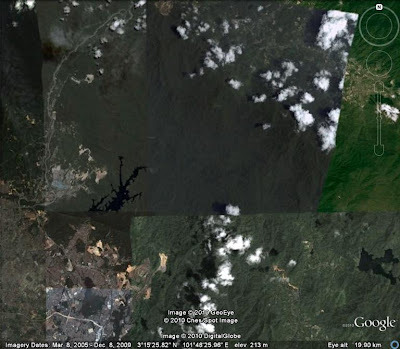 The biggest threat facing this forest is the rapid deforestation for residential zone expansion although it is unlikely that the entire forest will be destroyed anytime soon as the forest has been leased to the univeristy for the next 64 years. 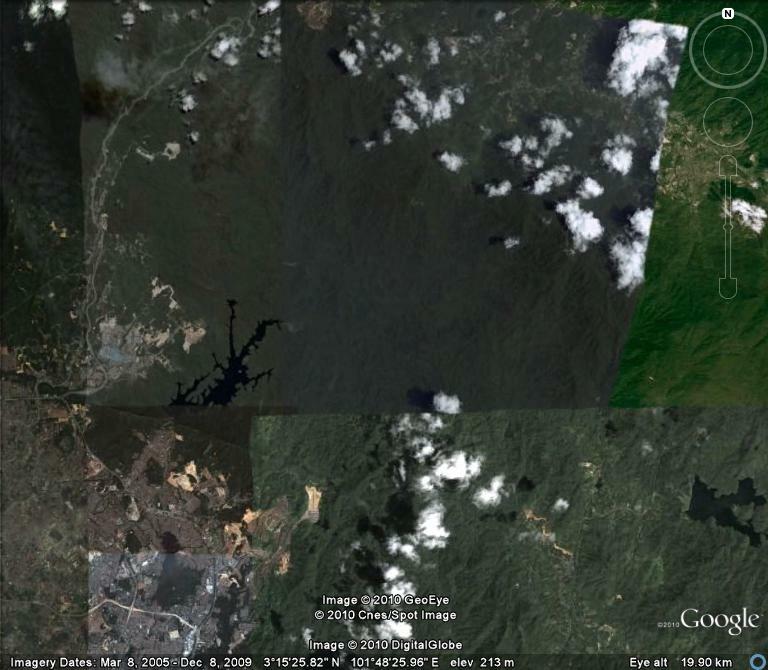 These forests are important water-shed areas but seemed to have experienced extensive urban and agricultural developments in recent years that are encroaching towards the reservoirs within the forests. This is particularly pronounced in the southern portion belonging to Bukit Cahaya and the north-eastern portion. 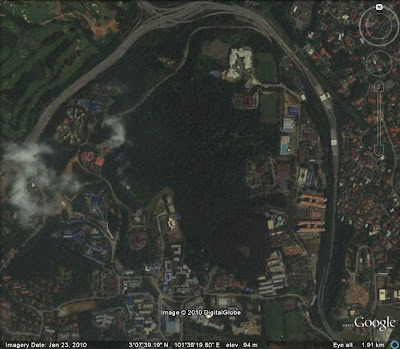 Ironically, Bukit Cahaya is home to the Malaysian Agricultural Park and has parts of it featuring the forest itself. However, there is only a small pool of local residents who voiced out their concerns and enthusiasm about the forest, rendering it harder to conserve the region's shrinking forests. mountains in its backdrop. 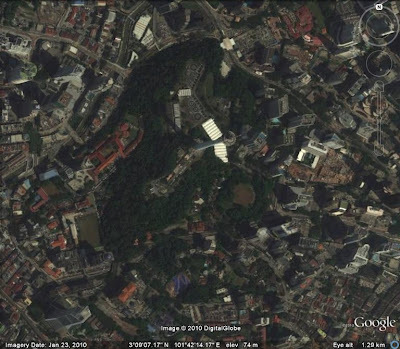 This area has been, like most other rainforests in KL, the weekend haunts of many local residents. 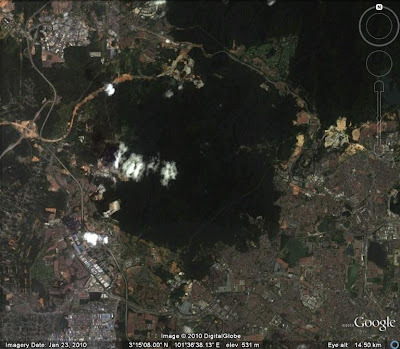 Hills such as Bukit Permai and Bukit Putih (Apek Hill) features several very popular waterfalls and trekking trails and has attracted hoards of people from all across Kuala Lumpur. However, foreign tourists have not frequented the area to date. Although no research has been conducted in its forest so far, it definitely holds some mammalian megafauna such as wild boars and macaques as anecdotal and photographic evidence have provided for years. Again, the disregard of local residents as important stakeholders when developing the hills have resulted in conflict and concerns for the safety of the hill slopes. Another region of similar geography as Cheras, this area also features some waterfalls and are as popular as those in Cheras. But the most important feature of this part of the city is the frequent occurence of landslides ranging from minor to fatal. 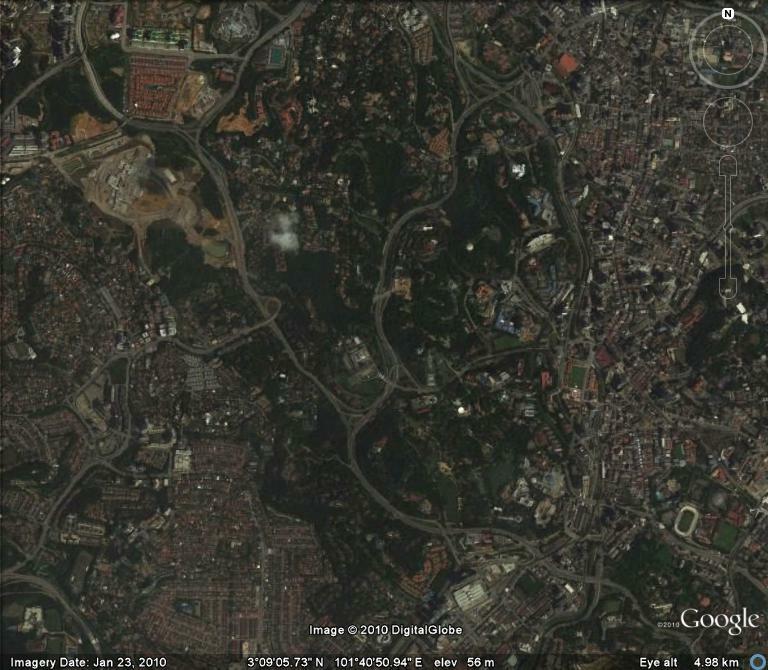 Perhaps the two most well known are the Bukit Antarabangsa 1999 landslide and the Taman Bukit Mewah landslide. They are grim reminders of the disasters caused by inconsiderate development on geologically unstable hills. Central section of Selangor State Park. Note the linear Bukit Tabur Quartz Ridge and the Klang Gates Reservoir visible at the bottom left corner of this image. The above list of forest are but the tip of an iceberg of significant areas worthy of preservation in KL and its surroundings. There are many more smaller but equally interesting tracts of forest remnants scattered across the city. All these forests faces the same issue of encroachment and destruction and ought to be saved in view of its economic, social and even political benefits that could be gained from such a move. The rare and relatively unknown ground dwelling plant, Thismia sp., is usually described as habitat specific and sensitive to disturbance, hence only found in primary rainforests. However, the surprising discovery of it living in the Bukit Lagong Forest Reserve have shown that Kuala Lumpur's rainforests, however small and isolated, are important reserves for tropical species including rare and endemic ones. Already, modern cities across the world are setting aside and creating tracts of important habitats as wildlife refuges and for recreational and educational purposes. Some examples include Australia's Adelaide's Urban Forest Programme, Brazil's Sao Paulo City Greebelt Biosphere Reserve and Canada's Ottawa Greenbelt. (Check out this link for more information: http://en.wikipedia.org/wiki/Green_belt) It is almost an unstated rule of thumb that cities should integrate with its environment and not the other way around. Of course, this must also be accompanied by responsibly planned urban development that seeks to control urban sprawl if the forest were to remain untouched by developers. Malaysia and it's capital's economy are largely build upon by the natural bounty of the land. 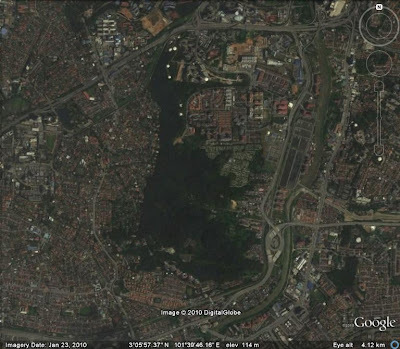 Kuala Lumpur will not be as modern and developed as in the vision and hopes of the Malaysian people if little or no acknowlegment of the importance of biodiversity is given in the form of the provision of wildlife refugia. ~Elwyn Brooks White, Essays of E.B. White, 1977. 10.Radzi Abas M., Ahmad-Shah A., Nor Awang M., 1992. 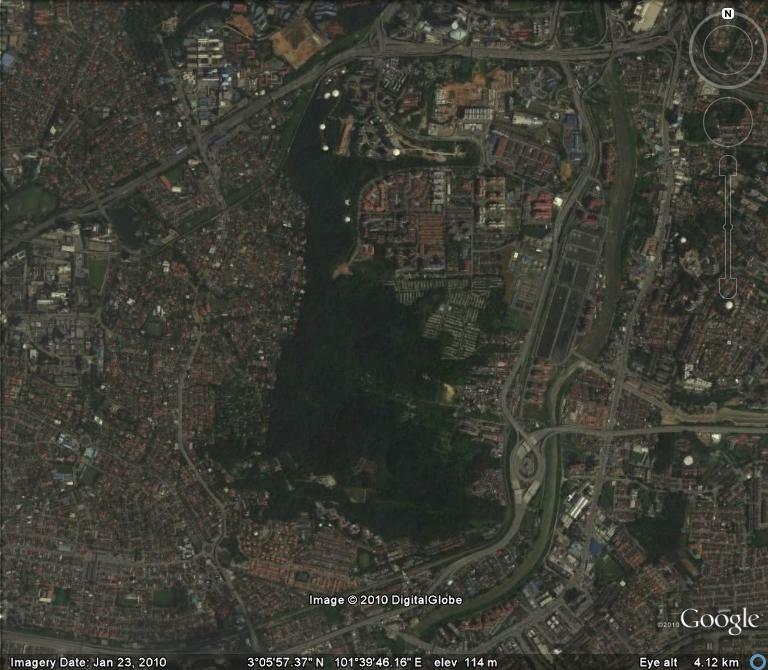 Fluxes of Ions in Precipitation, Throughfall and Streamflow in an Urban Forest in Kuala Lumpur, Malaysia. Environmental Pollution,Vol. 75, Iss. 2., p209-213, 1992. Good of you to compile all of these. Many thanks for highlighting these and in fact, how many of Klang valley-sapiens will be aware of the future of the green belts. I can only point my fingers to the ever increasing population growth and the demand for space. Add on (greed as well). How to slow down population growth?? Indeed rapid population growth is the primary factor that drives uncontrolled urban sprawl in Klang Valley.But slowing down the growth can be a tricky issue. More realistically, city planners should allocate reasonable number of nature reserves and wildlife-corridors (ie Native tree corridors) to connect the reserves to each other and the main forest block up in the highlands/outskirts of the city. This is not actually a weighty burden for the city planners. 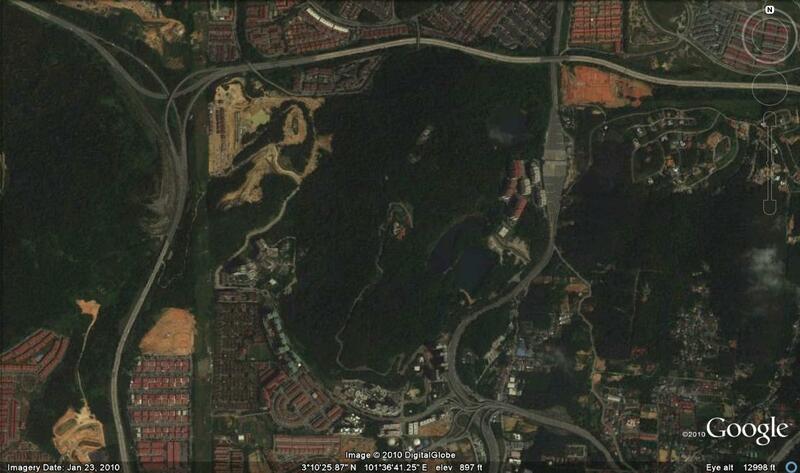 Much to the contary, existing forests in the city and roadside greenbelts can be integrated into such a scheme. 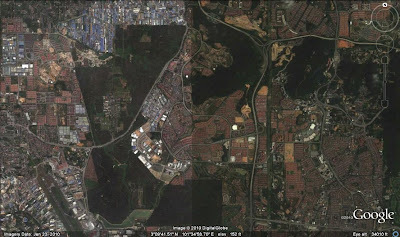 What's more, they can be used for recreational purposes (free of charge) as in the existing KL forests and is an important economic asset that could raise the land prices of neighbourhoods by a considerable amount. This is reflected by the daily newspaper advertising of prime residential locations nestled in rainforest surrounds. Other methods in urban planning include consolidating (increasing population density) residential zones and redeveloping un-used (non-forested) or underused lands in the city. All these are viable as far as KL is concerned. The only factor that stands between a developed, modern metropolitan and a rundown, mismanaged city is political will. Great post. I am very familiar with many of these places. 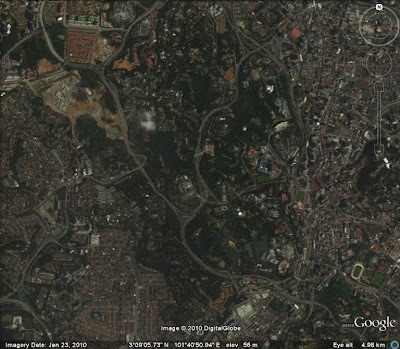 particularly Puchong forest and Bukit Cherakah. This and Bukit Cherakah still have many big trees. Thank you for your concern, mate!